The UC Board of Regents' approval of President Janet Napolitano's plan to raise tuition by up to 5 percent in each of the next five years, over the objections of Governor Jerry Brown and other state officials on the board, "has set up a showdown between the state’s politicians, the Board of Regents and students," reports Inside Higher Ed. Opponents of the increases "accuse Napolitano and the regents of playing politics and using students as hostages in a budget battle with Brown," according to the article. 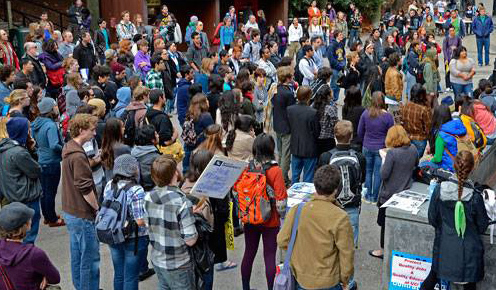 Students and staff, faculty, and community supporters demonstrated against the tuition increases, reports the San Francisco Chronicle, even sitting in at UC Berkeley’s Wheeler Hall last week in protest and occupying a building at UC Santa Cruz, bringing back memories of similar demonstrations in 2009. One UC Berkeley student was arrested but will not face charges, according to the Daily Californian. UPTE’s president, Jelger Kalmijn, issued this open letter to the regents opposing the tuition hike. Sacramento Bee Commentator Dan Walters believes the real issue behind the confrontation over tuition is not about money but about "who’s really in charge" of the university system. As explained in the StarTribune, Brown wants UC to "find a more frugal way of doing business," and UC leaders say his "ideas would destroy the university's standing as the nation's premiere public university." UC's chief financial officer Nathan Brostrom said they are expressing "competing visions." In Remaking the University, UC faculty dissect what they call the “public relations war" over UC's proposed tuition hikes and also analyze the impact of tuition hikes on undergraduate debt.